The NFL and Apple Inc.’s Beats by Dre brand may no longer have a working relationship, but one league’s loss is definitely the NBA’s big gain. 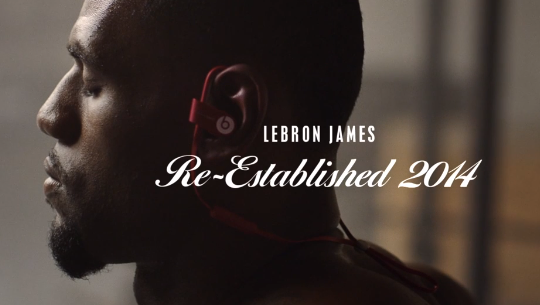 With the 2015 NBA season only a week away, we see the latest BEATS ad starring LeBron James in his first solo commercial since rejoining the Cleveland Cavaliers three months ago. Throughout the clip, the city of Akron welcomes their KING back home to the state that built the biggest professional athlete in the world currently. With a goal of bringing Cleveland their first title in over 50 years, we’re shown LeBron training in high school of Northern Ohio to make an official re-establishment of his legacy. Whether LeBron can cement himself as the greatest basketball player ever remains to be seen at the tender age of 29, but his public perception and image clean-up is at its highest peak ever.